If you’ve ever run a peer-to-peer fundraising campaign (or even fundraised as an individual) then you’ve probably encountered some variation of the mid-campaign slump. As you might intuitively suspect, the activity in a fundraising campaign tends to drop off once the excitement of the campaign launch fades. 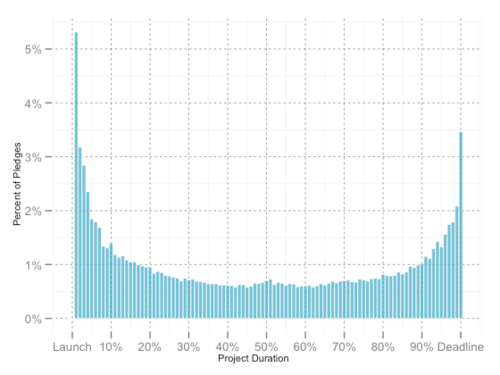 Here’s a great visual of what this “slump” actually looks like from the folks over at Kickstarter. As you can see the activity tends to cluster around the beginning and end of a campaign. This squares well with common sense. At the beginning of a campaign everything is new and exciting; people are eager to get involved. Towards the end of a campaign, the light at the end of tunnel emerges reigniting the excitement (there may also be a perceptual effect involved in the increase in activity at the end of a campaign). In the middle of a campaign, however, things can get very… blah. That’s where you, the one running the campaign, come in to save the day. By adopting some of the practices below, you can help pave the way forward for your fundraisers, help them know exactly what to do next, and minimize the impact of the dreaded mid-campaign slump. Before you launch your campaign you should have a plan in place for ramping up the excitement during the middle of your campaign. Have an ace or two, or five, or whatever, up your sleeve and ready to go. What does this look like in practice? It can take a number of different forms, but one of the most common devices to increase mid-campaign activity is a matching period. During a matching period, sponsors or other major donors underwrite the campaign effectively doubling every donation made during the period. Match periods are a tried and true method for injecting energy into a slumping campaign. Perhaps more importantly though, you should have a series of communications planned for the middle of your campaign that are designed to drive engagement. These are the prepackaged stories that you plan to tell: the story of the child who was saved by your program; the story of the researcher searching tirelessly for the cure; the story of…whatever you decide to communicate. Part of running a good campaign is keeping people engaged over time. Your fundraising strategy should be powered by emotionally engaging and genuinely interesting communications. You are only bounded by the limits of your own imagination. For inspiration here’s a really interesting example of an organization getting creative with email. Your communications should stoke the audience’s emotional fires just as the mid-campaign cooling begins, and then continue fanning those flames right on through to the conclusion. So far we’ve been talking about energizing your campaign from a top-down perspective. This is where you come up with an emotionally engaging communications plan or unroll a matching period and communicate that out to your base. That’s all good, but take a moment to think about what actually happens at an individual level when a campaign slumps. You have a bunch of fundraisers. They send out emails or make a few initial posts to social media. And then what? A lot of them stall out. What do you imagine is going through their heads when their involvement fades? Do they change their minds about the merit of your cause in a few short days? Probably not. More than likely they just don’t know what to do next. They are wondering whether it’s ok for them to send out more emails. They are distracted by the hundreds of other things going on in their lives. They are concerned that they will irritate people if they post too much on social media. Adopting this perspective can be a useful exercise for brainstorming proactive approaches to help your fundraisers through common sticking points. One objective of your communications should be helping them resolve these internal questions. Adopt their perspective at the outset, anticipate the challenges they may face, and then design your communication plan to help them overcome those challenges. One of the most common sticking points experienced by fundraisers, especially new fundraisers, is concern about sending out more than one email. Your communications plan and resources should help your supporters navigate around this common roadblock. Turn follow-up asks into campaign updates. It can be uncomfortable just asking people repeatedly for donations. Encourage supporters to turn follow-up emails into updates about their fundraising journey. Then they can include an ask and link as part of the general update. Provide examples. This one speaks for itself. Give supporters examples of follow-up emails to help them get the ball rolling. Have them mix it up. Email follow ups need to be spaced out reasonably, and it may not always be appropriate to include every contact that gets the first email on the second or third emails. In between, encourage fundraisers to use social media as a softer channel for asking for donations. Make collateral shareable. If you’re sending out truly great inspiring campaign content, direct your fundraisers to use that as the basis for following up. At the end of the day the mid-campaign slump is here to stay. By recognizing this and taking a proactive approach in line with the suggestions above, however, you can minimize its impact. Come into a campaign with a predefined strategy for motivating your fundraisers through the mid-campaign doldrums, and set yourself up to achieve the most successful outcome possible.